I have received an overwhelmingly large number of letters inquiring about the now famous, or, perhaps, infamous Wayne Floyd and his unusual book, Definition. Most of you know that Floyd was convicted of the murders of my friend, Dr. John “Doc” Holliday, out at Dude Ranch in West Texas, and of Old George Williams up in Winter Park, Colorado; or, to be more precise, I should say that Wayne Floyd was convicted of the murder of Holliday, and after it came to light that Wayne Floyd just is Eric Swanson, then Eric Swanson was convicted of the murder of Williams. It is intriguing, so I understand where all the letters are coming from. And it’s true, I did know both Swanson and Floyd, though I only knew Swanson for about six months, over his first year of PhD philosophy at Rice, and I only knew Floyd through that one phone call, in which, in Graham Guest’s book Winter Park, I come off as a pretty slipshod or lazy philosopher. And I must confess, at the time of that conversation, I hadn’t read Floyd’s manuscript closely or thought about it very seriously. What I did see clearly, though, in Floyd, through Definition, was a sharp philosophical-type mind at work, one I thought would do well at Rice Philosophy. Of course, I had no idea, and it was an incredible shock to me when I learned that I had admitted someone to undergrad philosophy at Rice, who, under another name, was already enrolled in the PhD program in philosophy at Rice. That was pretty incredible, so, yes, again, I do understand where all your inquiries stem. But now you’ve got to understand this: that what I’ve just told you is all the dirt I’ve got on the non-philosophical side of the Floyd/Swanson story, and it’s dirt I know you already have. So no, I don’t know what sort of clothes he usually wore or who his friends were or what sorts of things he said in class (he never took a class with me) or if he drank a lot or where he lived in Houston… I mean, not to be uncivil, but on and on, with these sorts of things, I do not know. I have, however, by now, spent some real energy and time on Definition, and I thought it was the least I could do, given all the interest, to address some of the philosophical implications of the book and give a proper reading of the thing. I have some misgivings about spending time laboring over and extending and potentially further popularizing a murderer’s work, but a murderer does not necessarily a bad philosopher make. The murders had nothing to do with Floyd’s philosophical work and everything to do with his abuse of drugs and alcohol, as I understand it, so I am comfortable taking Floyd’s philosophical work on its merits. I think we will find the language game Floyd creates in Definition to be at once beguiling, absurd, philosophically innovative, meritorious, and generative of further work. What is a dictionary? 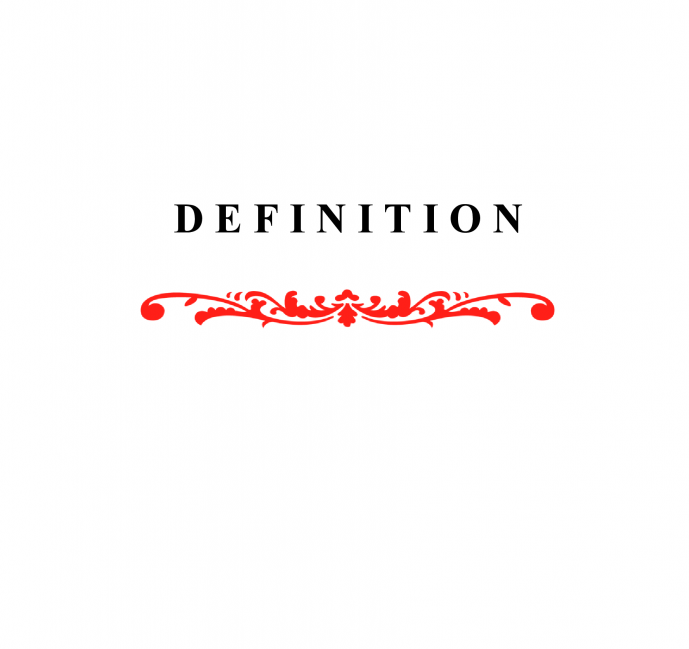 & What is a definition? Or, perhaps more precisely, What can we expect from our dictionaries? & What can we expect from our definitions? These are the main questions of Floyd’s Definition; or, I should say, rather, that these are the main questions that precipitate out of Floyd’s Definition because he never comes right out and asks them. So, right away, point number one: obliquity. Obliquity, indirectness, showing instead of telling are more literary techniques than a philosophical ones (unless you’re Derrida), so you’ll want to be aware, as you read Definition, that you’re dealing, at least methodologically, with a mixture of philosophy and fiction and that, while this combination, along with the more informal narrative voice, might make for an easier, more enjoyable read, it will also obfuscate some of the broader philosophical points. It also suggests or at least opens up the possibility that, while Floyd certainly seems to understand the details and the development of the particular philosophical rules and methods of his project, he may not actually know what the broader philosophical implications of his project even are: he sees the philosophical trees, but he may not see the philosophical forest. Floyd’s method, or approach, then, is to look at the (there is only one) definition of “parking lot” – an open area of ground in which people can park their automobiles, from one dictionary – let’s call it Mac 4 – and check it (the definition) against the world, but where what this entails is looking at the definitions of all of the material terms of the definition of “parking lot”: “open,” “area,” “ground,” etc., most of which have more than one definition, and checking those against the world as well. What Floyd hopes to show, in the end, is that Mac 4’s definition of “parking lot” and all of the parking lots out in the world are, indeed, consistent with each other, and that they are so without making any unauthorized changes to Mac 4’s definition of “parking lot” and without having to include as parking lots things that are not parking lots or exclude as parking lots things that are parking lots. Floyd’s implied (again, because it’s not explicit) bigger idea is, I think, that if this consistency can be proven up via the analysis of the definition of “parking lot” from Mac 4, then that’s a good sign that it’ll work for all the other definitions in Mac 4. Floyd is swift to acknowledge, however, that there are big problems in trying to show that Mac 4’s definition of “parking lot” and all the parking lots in the world are consistent, but he’s also really motivated to overcome those problems; in fact, at one point, he’s perfectly candid about how desperately he wants to establish this consistency, to make it so. And one big important point here may be that where there’s a philosophical will, there’s a philosophical way for, indeed, Floyd’s will, or drive, or desire, does seem to produce a number of really creative, innovative philosophical moves, moves which ultimately, or by the very end, appear to earn him something very close to success in his project. The secrets to Floyd’s success are not really as mysterious as I make them out to be in Winter Park. In his definitional analyses, he simply takes advantage of words with multiple definitions by picking the definition of that word that best corresponds with the ways parking lots actually show up in the outside world (even if sometimes – or at least once – that definition is not relevant and applicable given the context: a move which, of course, it’s hard to see could be possibly be authorized – see his long analysis of “open”); in both his definitional and synonymal analyses, he takes advantage of non-material differences between definitions, like mere word order, to make critical substitutions of terms, one of whose other ostensibly relevant and applicable definitions corresponds with the ways parking lots actually show up in the outside world (see his analysis of “ground” and “field”); and in his synonymal analyses, he takes advantage of identicality, non-material differences, and I’ll show in a minute how he could’ve taken advantage of material-but-non-lethal differences between definitions of words and their related synonyms to make critical substitutions of terms that make the definition at issue correspond with the ways parking lots actually show up in the outside world (see his synonymal analysis of “automobile,” “motor vehicle,” and “car”). These are Floyd’s methods of transitivity and substitution, and they entail the slight-to-not-so-slight shifts in meaning that allow him to, among other things, move across this dictionary and transpose and reconstruct his definition of “parking lot” from (1) an open area of ground in which people can park their automobiles to (2) an expanse of something in which people can park their automobiles, the ultimate effect of which is that the definition of “parking lot” becomes broader: it no longer excludes things in the world that Floyd is confident are parking lots. The question does arise, though, whether this new, transposed definition is now too broad, too inclusive, because, according to it, it would appear that any and all expanses (of whatever) are automatically parking lots (i.e., the “world parking lot problem”), which, of course, describes a situation that does not correspond with the world as we understand it. But, he pretty successfully stuffs these concerns with his moral/legal analysis of “can,” pursuant to which he shows that there are almost always stronger legal and/or moral rights in effect that step in and prevent all expanses from being parking lots. But let’s back up and take a couple of quick examples of Floyd’s methods. In his definitional analysis of “open,” Floyd runs into trouble with the various relevant and applicable definitions of “open” and so proceeds to violate, albeit humorously, his rule of relevance and applicability by seriously pursuing “open” definition (39) that part of the field beyond the line of scrimmage where a ball carrier encounters fewer potential tacklers. Then he discovers, late in the game (as it were), that the definition of “field” – an area of open ground, is materially the same as a section of the definition of “parking lot” that says an open area of ground, so he replaces that section with “field,” and finally chooses a different but, in this case, properly relevant and applicable definition of “field,” an expanse of something, to replace “field” and eliminate the open problem, along with his unathorized use of “open” definition (39), once and for all. Pretty brilliant. In his analysis of “automobile,” one thing Floyd does not do that he could’ve and really should’ve done is, quite simply, change out, or substitute, “motor vehicle” for “automobile” on the basis of its being a perfect related (materially-but-non-lethally-different) syononym of “automobile.” Doing this would create, as a new-final transposed and reconstructed definition of “parking lot” – an expanse of something in which people can park their motor vehicles, where “motor vehicle” is defined as a car, truck, or other road vehicle powered by an engine, and it would produce at least three salutory effects: (1) it would eliminate Floyd’s dependency on the strained (if also brilliant) analysis of the definition of “automobile” – a road vehicle designed to carry a small number of passengers, wherein, in his truly laudable efforts to get a driver into that automobile, he winds up having to put forth and rely on the super-dubious and just kind of absurd notion that human duality is a fault or imperfection; (2) it would allow him to avoid the absurd conclusion that big buses – which are obviously designed to carry a large number of passengers, not a small number, as required by the definition of “automobile” – can’t or don’t park in parking lots; and (3) it would be good (and “green”) because, via its employment of the naked or unmodified word “engine,” it opens the door to alternative energies: electric, human, etc. (1) It shows that this definition of “parking lot” was not so well defined or perfect or absolute to begin with, and that it improved with revision. (2) It shows that if we were to treat this dictionary and its definitions as absolute and unrevisable, then we would get absurd results, like that automobiles don’t have drivers and that there are no concrete parking lots. (3) It shows that, pursuant to certain rules of transposition, this definition, the definition of “parking lot,” can be revised and improved solely from within Mac 4 itself, or solely by referring to other words and definitions in Mac 4 itself; but, it’s also pretty clear that Floyd’s restricting himself in this way is, ultimately, a mere contrivance for the game, for the sport of it, as it were, because, while this work does show that Mac 4 is to some significant extent self-sufficient and self-correcting, there is no requirement that this or any dictionary be self-sufficient and self-correcting: we do not ask that our dictionaries be able to provide solutions to their deficient definitions solely from within. (4) Moreover, it also suggests that a dictionary’s ability to self-heal (as it were) like this might not even be all that momentous or impressive anyway because if our rules of transposition allow us to try on all the various relevant and applicable definitions of a word, and all the relevant and applicable definitions of the all words in all those definitions (etcetera etcetera), and all the relevant and applicable definitions of the synonyms of that word, and all the relevant and applicable definitions of the all words in all those definitions (etcetera etcetera), then don’t the chances that we’re going to be able to reconstruct a definition that better corresponds with the world just go way, way up, I mean, almost exponentially? (5) It shows that where there’s a philosophical will, there’s a philosophical way: the philosophical creativity and innovation Floyd shows in developing the rules and getting done what he wants to get done, what he feels has to be done, is pretty remarkable (and perhaps it actually helped in this regard that he started from scratch: he had to make it all up as he went along). (6) And it shows that Floyd is doing definition-writer work here: he’s tightening a definition so that it better comports with the world; and, more generally, it shows he’s doing philosophy of lexicology. If it’s true that definition-writers take rough field reports (called semiotic chora) of the ways in which words are being used in a particular community at a given time and then tighten and refine the meanings of the words gleaned from those use-reports into definitions, then maybe we can say – and without forsaking its lexicality at all – that the tighter the definition, the more philosophical the definition, that is, the closer the definition comes to not just capturing some of the necessary conditions for the presence of the thing-in-the-world and for the proper use of the word that represents it (i.e., the gist of the thing), but to capturing the necessary and sufficient conditions for the presence of the thing-in-the-world and for the proper use of the word that represents it.